Food banks, pantries and other food access advocates are bracing for increased need in communities that struggled with food insecurity even before Hurricane Harvey — and planning how to meet needs in the months of recovery still ahead. Dan Maher is watching the inconvenience of disaster settling in as Hurricane Harvey victims trickle back into Beaumont. As residents make their first visits to lost homes and begin the daunting Federal Emergency Management Assistance application process, Maher, executive director of the Southeast Texas Food Bank, is preparing his staff for the coming onslaught of people turning to them for meals. Since the storm, they've given out more than 1.5 million pounds of food. Right now, the challenge is handling a surge of food donations that have arrived from across the nation — Maher says they’re going to need more warehouse space to hold it all. But he knows the food bank will also have to prepare for the eventual slowdown in donations after national attention shifts away from the Texas coast. And he knows the need for food will last much longer. Thousands of Texas households impacted by Harvey are now eligible for disaster food assistance, and as the Texas Health and Human Services Commission begins sign-ups, food banks, pantries and other food access advocates are bracing for increased demand in communities that struggled with food insecurity even before the storm. And they're planning how to meet those needs during the months of recovery still ahead. Before Harvey, Harris County had 669,709 people regularly using food stamps. People have already started receiving benefits under the federal Disaster Supplemental Nutrition Assistance Program, or D-SNAP, which gives eligible Harvey victims up to two months of benefits to buy groceries. A four-person household can receive up to $649 toward groceries under the program. Applicants have to live in one of the 39 counties covered by the federal disaster declaration and must show they’ve lost income, had their home damaged, paid for disaster-related expenses like temporary shelter or home repairs and didn’t receive benefits from the federal Supplemental Nutrition Assistance Program, or food stamps, before the storm. They also have to meet income eligibility requirements. In those 39 counties, 1.1 million people were already using SNAP in August. Carrie Williams, a spokesperson for the Texas Health and Human Services Commission, said in an email that information about disaster food assistance is spreading quickly and that the agency has been dispatching staff to oversee signups in areas that Harvey struck. The agency initially required applicants to go back to their home counties to apply for food benefits but reversed that policy. Many flood victims are temporarily living far from their storm-damaged homes. The application process for D-SNAP, unlike regular food stamps, doesn't count applicants' vehicles as an asset toward their income. The program also doesn't refuse applicants based on citizenship or immigration status and there are no work requirements, said Rachel Cooper, a senior policy analyst for the Center for Public Policy Priorities. Williams said Health and Human Services Commission staff are pointing rejected D-SNAP applicants to food banks and other state programs for help. Meanwhile, the Houston Food Bank has seen a surge of flood victims and is looking to the state to take some of the pressure off. 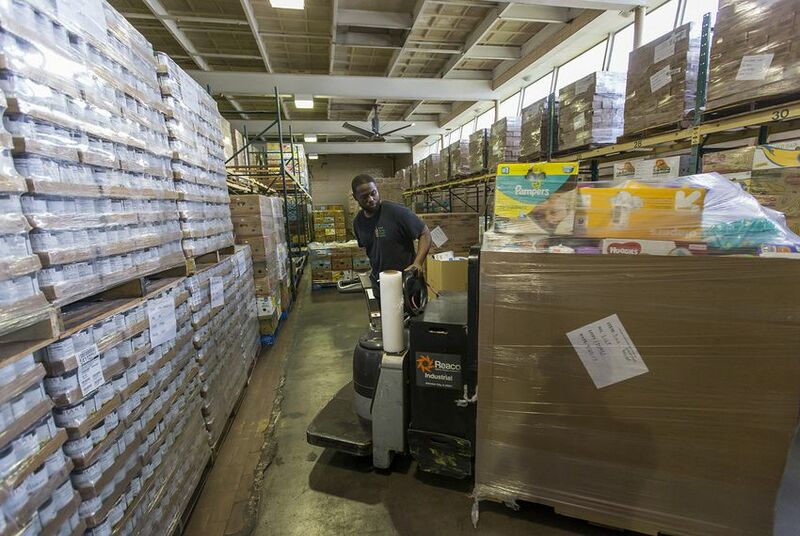 Staffers at the food bank are distributing 700,000 pounds of disaster relief food donations a day — more than double their normal daily volume — as well as diapers, bottled water and cleaning supplies. That may sound like a lot, but Brian Greene, the president of the food bank, said “it’s not nearly enough.” Greene said he and other Harris County-area food banks and pantries are anxious for D-SNAP sign-ups to start because it will mean more people who can go to a grocery store for food instead of coming to food banks. And any relief from D-SNAP will be temporary. Recipients' federal food aid runs out after two months. “It’s going to take more for them to rebound and rebuild and have access to food even when the stores are back, even when they get back to a place where they can cook food,” said Ellen Vollinger, legal director for the Food Research and Action Center, a nonprofit organization focused on hunger and nutrition policy.